Auction Closed. Sold via Buy Now $800. Next Auction: Monday Feb 13. 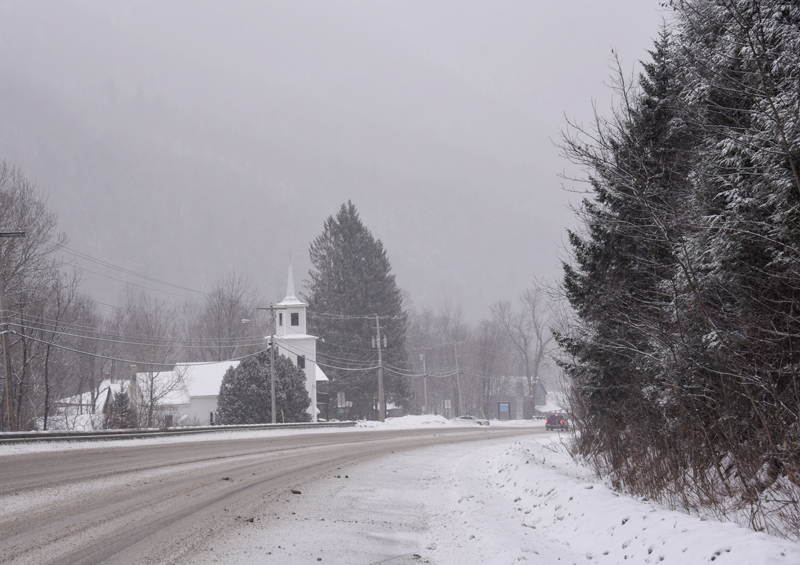 The little white church in Killington has served the community well for many years. Tenacity and resilience seem to be common character traits in Vermont. Thank you. Every week I get to have this warm nostalgic happy feeling when I see your name in my inbox. They are all amazing. Thanks so much Kim, that makes me very happy. I love your work. Thank you for emailing me it to me and for reminding me of the beauty of Vermont!!! Another beauty! Peter, I love this! I feel like I’m almost there, sensing the icy roadbed under my tires and experiencing the cold wind buffeting my car as it whips down from mountain heights. Swirling snow periodically obliterates the hills and trees behind the church, only to clear again a few moments later. 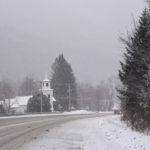 Winter in Vermont ski country! 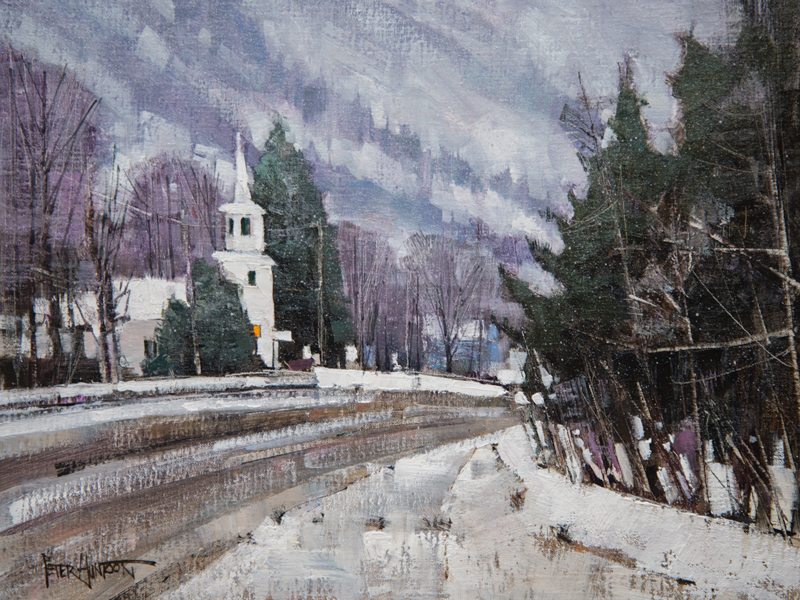 I especially like the sense of texture in the roadway and adjoining snowbanks, and the heavy atmospheric influence upon the background hills and trees. You describe the conditions perfectly Brian! I was hugging the shoulder as traffic rumbled by kicking up even more snow than was falling already. I suspect you captured the frigid temperatures in this one, Peter. Is there any corner of Vermont without a theme to paint? The colleges, the churches, the farms, the mountains, the wilderness, the parks, the flowers, these astonishing covered bridges, the villages, the stores, the rivers, the snowy landscapes with winding roads, the cascades, the stones, the meadows, the cattle, the sky…. Surely it’s impossible. More than anything else your paintings depict this lovely corner of the earth. I’m very content with your works. Thanks very much Doris! One corner I have neglected but plan to visit VERY soon is the North East Kingdom of Vermont. Hopefully you will see something from that area soon here on A Day in Vermont. another great job Peter, congrats. really liked the painting & i know the scene oh so well. you really captured the feeling and image of “comin’ round the bend” from Killington Mountain. Thanks Mike, I thought of you painting this one!